Rod, what long downloads are you contemplating? my name in Justin Fox and I am a photography student in London, Ontario Canada and currently a Nikon D610 shooter. Once the Fuji X-T2 is released I plan on switching from Nikon to Fuji, I just hope it gets released before I go on exchange to Ireland in mid September. If anyone would like to check out some of my work, I am jfoxshoots on both instagram and 500px. I look forward to interacting with everyone in this community and jumping into the Fuji world soon! Hello, I am a new X100T user, and am hoping to pick up information and advice to become a better photographer with my first Fuji. A couple of weeks ago I went to Norway hiking with my son and I loved the (less) weight of the Fuji gear as well as the quality of the images I got! Sorry Rod, I maybe a bit thick but why not change the SD card, don't see why you need to download from the camera, or to what you are down loading to? If it is to a laptop or the like why not get a USB card reader? Sorry if I've missed the point. Hi everyone, greetings from The Netherlands. I've recently bought a Fuji XT10, loving every minute of it. A great little camera that's really inspired me to go back out there and get back into photography. Living in a small town just south of Amsterdam I have plenty of things to take pictures of. I've done photography courses back when I was still living in Scotland (using something called "film") so I'm happy with the technicalities of photography. What I still need to learn is the fine art of composition - finding the right angles, the interesting shots, and so on. Hopefully someone here can help with that. I shoot using either the standard Fuji 16-55mm kit lens or a pair of old Pentax lenses, a 28mm f2.8 and a 50mm f1.7. My interest is pretty much anything except street photography (lack the courage) and animals/flowers (lack the interest). I post my stuff on Instagram where I'm known as @zerozero31. I also shoot fashion, street and travel when possible. So i travel the world shooting everything I can. I was a Canon shooter since forever but finally saw the light about 2-3 years ago! Not sure where my intro post went..? I hope I can learn and contribute here. Hi. Recently moved 'up' from micro 4/3 after playing with a borrowed Fuji body and the two XC kit lenses. Still learning, but enjoying the process. Fuji x-user put away the nikon in the closest for close to two years. Have traveled with the system to Patagonia, Hudson Valley New York, the Oregon coast, and love the images produced. Live in Atlanta, GA, passion for photography and conveying what I see. If it does not interest me, I usually don't shoot the shot. Brand new to the Fuji world - have taken the plunge into the unknown after playing around with a D90 for the last couple of years. Given that I now own a couple of Nikon prime lenses, the inertia to move to a new camera system was immense - but I was intrigued by the different form factor of the Fuji bodies and the wonderful lenses. After playing around with the Fuji XT1 in the local shop with the new 35mm f2 attached, I was sold. I have the new XT2 on pre-order and am hoping that it arrives before my trip to Asia in October.
. I have the new XT2 on pre-order and am hoping that it arrives before my trip to Asia in October. I hope for you too. And welcome! Hi all, i'm Gareth and I live in Northamptonshire, UK. I am a full time retoucher, and an 'enthusiastic amateur' when it comes to photography. I have owned mostly Canon cameras before, although I did dabble with Mirrorless with the Sony a6000 and just wasn't 100% happy. However now I have 'discovered' Fuji, I am absolutely loving it! A total convert. Look forward to joining in on the forum! I'm a new Fuji X-T2 owner and registered to this forum to look for tips and share any issue I might encounter with you guys. I live in Belgium and I'm 51, I take pictures as a part time job. In my other life I'm an IT guy. Hi. Just took delivery of my XT2 today. Have previously been a Canon DSLR user and recently Panasonic LX100 and FZ1000. I always thought the Panasonic rocked until today. I have been absolutely blown away with the quality of my test photos on the XT2. Really cannot believe the difference in quality. Fantastic start to being a new user. Great to see the new X-T2 bringing new people into the 'family'! Welcome. I've been shooting with Fuji for a few years now. My kit includes an original x100, an x30 and an X-T1. I have a range of lenses: 10-24 f4, 16-55 f2.8, 16 f1.4, 56 f1.2, 50-140 f2.8, and 100-400 f5.6. I've adopted this package for travel as my Nikon gear was bogging me down--an my wife would let me travel with all the heavy-weight gear. My package is great for backpacking in my Mindshift pack where I also carry filters and a MeFoto carbon tripod. I mostly enjoy street and documentary photography but have found myself shooting a lot of landscapes and nature, as well. I recently uploaded a few images from a recent trip to Alaska (see Alaska-2016). Please comment or send messages, if you'd like. 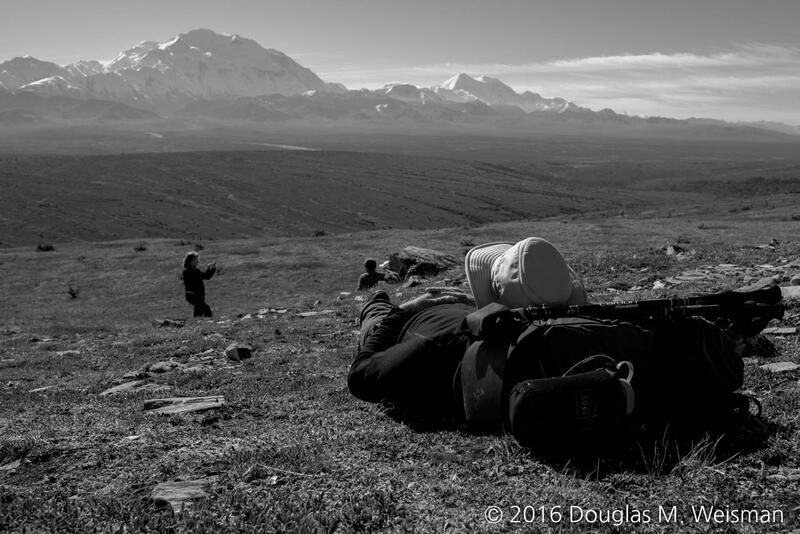 The photo is me "tundra napping" with a view of Denali at Denali National Park, Alaska. Hi, I'm Dave from Kansas City. I started shooting Fuji when I bought an XT1 a couple of years ago. I've been slowly selling off my Canon gear and acquiring an assortment of Fuji equipment. Most recently I purchased the XT2 and as soon as I received it, I sent in my XT1 for infrared conversion. I'm anxious to test it when I get back, and if the performance is as good or better than my converted Canon, I will be able to finally cut the Canon cord. Hello, I'm John in Los Angeles. I'm a professional cinematographer with loads of canon cinema gear. I wanted a different paint brush to work with for my personal photography and after playing with an XPro2 earlier in the year I felt Fuji was the right pick for me. Picked up the XT2 and a few lenses last week and now I'm having a blast! I'm on instagram @jmgardiner and if I ever remember my flickr account information I'll start posting there again too. Hi, my name is Elisha and I fell in love with the original X100. Since then I've owned all versions of that camera, along with an X-T1 and now an X-Pro2. I love these little cameras and I'm happy to be part of a community that shares my love of Fujifilm. Welcome John ..... you have some great images on your site - not surprisingly you have a good eye for the light! One comment we often hear in relation to Fuji prime lenses is that they have a 'cinematic' look - is that true? What's the thoughts from a professional? Hello. As you might guess, I live on Maui and my name is Mike. Been using a Canon system since the 30D about 10 years ago; still have a 5D3 with the 24-70L II, 70-200L f4 IS, and 100 2.8L macro. However, since exiting the wedding business as a weekend warrior, my photography and video is more about travel and hiking with my wife, and family vacations and gatherings. I've sold my other Canon gear rather than having it just sit around. So, here we are on this site, which truthfully I didn't expect as I was literally a click away from ordering a milc by a different brand. It stayed in the cart for a few weeks, when by chance I happened upon an X-T2 YouTube clip on one of the photography channels I follow. After that first X-T2 clip finished, as some of you know, YouTube will list similar clips. The more I watched, the more I became interested. To cut to the chase, I rely heavily on websites like this for purchasing decisions, as the handful of stores here with cameras only stock consumer level gear (and even that is slowly disappearing). I've purchased all my Canon gear unseen, so it's nothing new to me, especially since the online stores I purchase from all have full refund return policies. I appreciate what I've seen on this website and will continue to peruse the various forums here, especially the X-T2 and the lenses. I'll also look for something for my wife, as she is interested in moving up from her smartphone when we're hiking. Lastly, I'm undecided on what to do with my remaining Canon gear. Certainly selling will help with funding, but we'll see as I do have requests once in awhile for outdoor portraits. Thanks Frank. Everyone has a different take on what "cinematic" is. From my perspective the camera and the primes I've used thus far do have a cinematic look. The color out of the camera is pleasant and the highlight roll off is nice and smooth. The primes I'm using (18mm, 35mm2, 56mm) all seem to have a really nice focus roll off and a cat eye bokeh similar to a lot of cinema glass. Flare hasn't impressed me that much though. Lastly "Classic chrome" is one of the best stock camera profiles I've ever used, the desaturated highlights are spot on. From the USA, state of Pennsylvania -- and I hate forums. BUT, you all are so knowledgeable (when you're not arguing senselessly) that I finally had to join. I've shot a number of X cameras from the original X100 up to my current X-Pro2. I've slimmed my kit down since I'm primarily just an art photographer and shoot only primes now. I don't have enough time for photography. I'm sure you feel the same. Love my system but I'm not a fanboy -- it's a means to an end and for me the best means. I used to shoot Nikon DSLR's and back in the day Ricoh and going back to my childhood in the 1960's I got started with a Kodak Pony 135 Model C and Ektachrome slide film. It's been a long strange trip through medium format "reflex" waist level shooters, to SLR's, to cheap digital and finally DSLR's. I had a brief flirtation with micro four thirds which is really very good, but not for me in the long run.